Cult Scottish miserabilists The Just Joans are delighted to be releasing their first new album in more than a decade, following the band’s signing to Fika Recordings. The band are excited to release You Might Be Smiling Now…, a self-recorded and produced collection of new songs. The release offers more of the same cynicism, but from an older if not necessarily wiser perspective as evidenced on lead single No Longer Young Enough and You Make Me Physically Sick (Let’s Start Having Children) is a jaundiced slice of toybox pop that crosses The Human League and Harold Steptoe. Complementing this shift in tone comes a more polished electronic sound on tracks A Matter of Time and Someone Else That You Like More Than Me while O' Caledonia sails along at a blistering pace like no Just Joans lament before it. Today we're releasing your final preview from the new record from The Just Joans! David Pope of The Just Joans had this to say about the track: "it is an ode to the tragicomedy that is the weekend. TFI Friday quickly evaporates to be replaced by FML Sunday, and the perpetual search for someone to stay in with inevitably ends in heartache and hangovers". The album is out on the 1st of December, and we're shipping all pre-orders out now to ensure you get your copy ahead of the official shop date. So if you're after the heavyweight vinyl or the CD, then head over to the Fika Recordings shop and buy your copy - you'll get an immediate download of all 4 tracks we've released so far too. Buy The Just Joans "You Might Be Smiling Now..." on vinyl, CD or digitally. "‘O Caledonia’ is a song inspired by my four-year-old niece who is, as yet, completely oblivious to the pain, misery and heartache that lies in wait just around the corner. This is our message to the young: You Might Be Smiling Now... Perhaps it’s the legacy of John Calvin and strict Northern Presbyterianism. Perhaps it’s the miserable weather and shite football. Either way, there feels a peculiar doom-laden cynicism at the heart of the Scottish psyche. Life is long and hard and filled with sin and guilt, and that’s the way it’s meant to be. Enjoy the song - or, actually, don’t enjoy the song. Just set your face against the wind and endure it." From their 2006 debut album Last Tango in Motherwell through a series of successful EPs, to 2012’s compilation Buckfast Bottles In The Rain, the acerbic wit in David Pope’s observational lyrics have helped make the band a firm favourite of the indie-pop scene. Their rise has seen them play a plethora of international festivals, such as Wales Goes Pop, Indiefjords, NYC Popfest, and of course the Indietracks festival, of which they have been long-standing cult favourites since their first appearance in 2008. The band are excited to release You Might Be Smiling Now…, a self-recorded and produced collection of new songs. The release offers more of the same cynicism, but from an older if not necessarily wiser perspective as evidenced on lead single No Longer Young Enough and You Make Me Physically Sick (Let’s Start Having Children) is a jaundiced slice of toybox pop that crosses The Human League and Harold Steptoe. Pre-order You Might Be Smiling Now... on heavyweight black vinyl, CD or as a download. 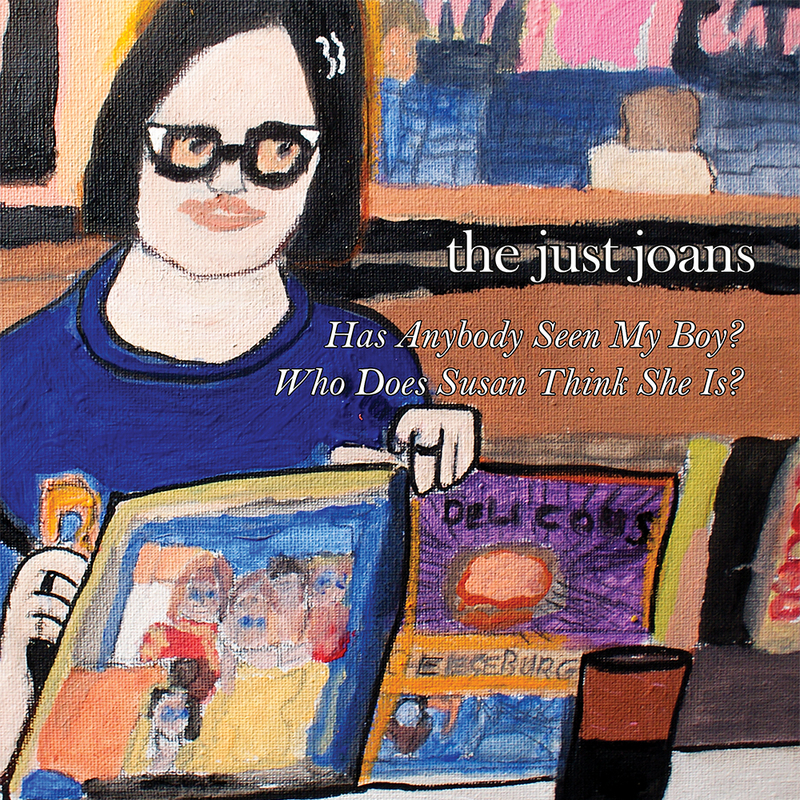 Named after a long-standing agony aunt from a popular Scottish newspaper, The Just Joans formed in Glasgow in 2007. Over the last ten years they have released a series of EPs on WeePOP! and have built something of a cult following among navel-gazing indie types. Their songs detail the highs and lows (mainly lows) of modern life, with a particular focus on failing relationships and missed opportunities. Musical touchstones for the band include The Magnetic Fields, The Shangri-Las, Smokey Robinson, The Kinks and Orange Juice. Now, after a recording hiatus of several years, The Joans are back with a brand new single "No Longer Young Enough", a girl group-esque ode to that realisation when facing a Saturday night of clubbing that you'd much rather stay in, read a good book and feel fresh in the morning. The single also features original artwork by painter and singer with the band, Katie Pope. A new album, You Might Be Smiling Now..., will follow later this year. It's been five long years since The Just Joans released their first full length album on WeePOP! and we've been eagerly awaiting what was to come next. So we're obviously VERY excited to be saying The Just Joans have joined us here at Fika Recordings. We've got a brand new 2 track 7" vinyl from them out in July (just in time for Indietracks). No Longer Young Enough is on mustardy yellow vinyl, the flip side has Breakfast For Our Tea. If you've seen The Just Joans lately, there's a chance you'll remember one or other of these.. This one's available to pre-order right now.